If you have been on the hunt for something really special or unique for the little people in your life, then call off the search because Birdy Numnum can deliver. Kylie Wiffen, the name behind Birdy Numnum, is one talented mum who loves nothing more than to create special pieces for babies and young children using vintage materials, knitwear and new fabrics. One look at her range and you won’t be able to resist ordering at least one thing. 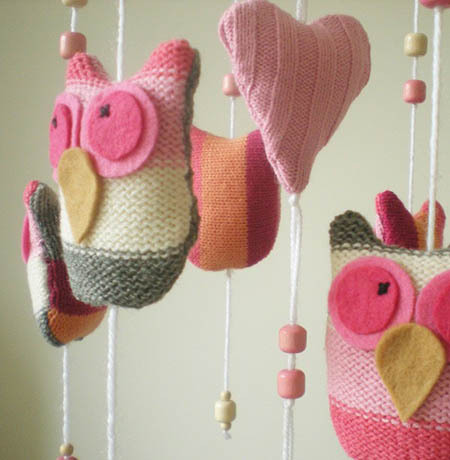 The limited edition Knitted Owl Mobile (pictured above) is nothing short of swoon-worthy and a superb addition to any nursery. Birdy Numnum artwork and soft toys are gorgeous, all pieces complement each other in their style. I personally love the Bird On A Hill collage with its earthy tones including pops of pink and orange, not to forget that cute bird. All artwork comes completely framed too which is a bonus – you get to hang it and enjoy it straight away! To see how fabulous Kylie really is, check out her Etsy store Birdy Numnum Design. Prices start at US$32 with delivery available Australia wide.